A change in the status quo of the frozen Nagorno-Karabakh conflict would affect all regional players, writes Antonia Colibasanu. Antonia Colibasanu works as analyst for Geopolitical Futures, a global analysis company founded by George Friedman, an internationally recognised geopolitical forecaster and New York Times best-selling author. Azerbaijani President Ilham Aliyev has said that a “reasonable compromise is possible” on Nagorno-Karabakh, hinting at the possibility for the breakaway region to become an autonomous republic. This comes after Russian Foreign Minister Sergey Lavrov invited Turkey to participate in moderating the peace talks between Armenia and Azerbaijan over Nagorno-Karabakh, during the annual summit of the Russia-led Collective Security Treaty Organization (CSTO) held in Yerevan on 14 October. The CSTO operates under the Minsk Group, a mediating body founded in 1992 that oversees the Nagorno-Karabakh peace negotiations. The Minsk Group is chaired by the US, France and Russia who also have decision-making powers in the negotiations, while Turkey (which is also a member of the group) doesn’t have a deciding role. Russia’s move to recognize the positive role that Turkey can play in the negotiations seems to be a significant shift – even if it is not an invitation to co-chair the Minsk Group, which would have to be approved by consensus. Toward the end of the Soviet Union, in 1988, Azerbaijani troops and Armenian secessionists began a war that resulted in a truce brokered by Russia in 1994, which left ethnic Armenians in charge of the de facto independent Nagorno-Karabakh territory. Since the cease-fire, Azerbaijanis resent their loss of Nagorno-Karabakh, which they regard as rightfully theirs, while Armenians show no willingness to give it back. Clashes following the breach of the cease-fire, as well as failed negotiations, have turned the area into one of the more critical post-Soviet frozen conflicts in the Caucasus. Nagorno-Karabakh is where all the regional powers meet as they project power to maintain influence in the region. The Caucasus region is important for Russia, as it blocks Turkish and Persian access to the heartland. While keeping control in the North Caucasus around Chechnya and Dagestan is a strategic imperative for Russia, keeping the balance in the South Caucasus to counter Turkish, Iranian and above all Western or American influence is also important. Russia has forged economic and military relations with Armenia, coordinating closely on regional affairs. For Turkey, Armenia has been an enemy since the end of the World War I. As the Ottoman Empire was collapsing, the Turks killed a large number of Armenians, which Armenia insists was genocide. The Turks have denied that a genocide occurred. But the large Armenian community in the US has used this event to try to shape US policy toward Turkey. While Turkey has reportedly attempted to normalize relations with Armenia, it cannot reach an understanding, considering the historical differences and Russian influence over Yerevan. 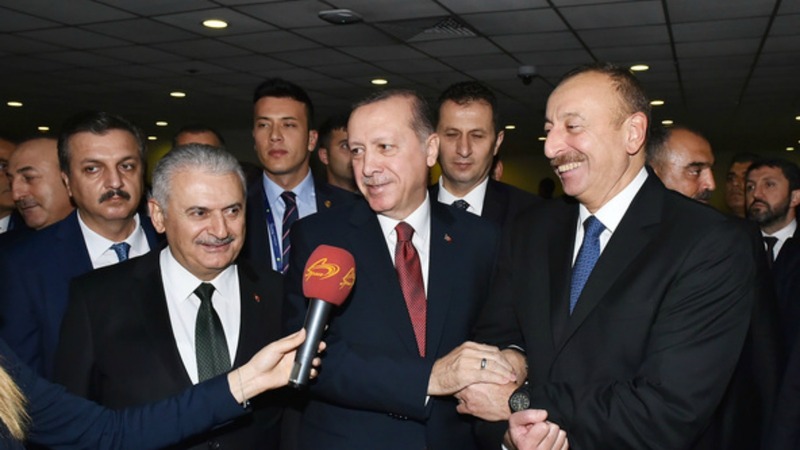 Turkey has close relations with Azerbaijan, with whom it shares ethnic kinship, cooperating on political, economic, energy and military issues. The European Union also looked into ways to develop relations with Azerbaijan in an attempt to diminish its dependency on Russian natural gas, since Azerbaijan has vast energy reserves. Therefore, a change in the status quo of the frozen Nagorno-Karabakh conflict would affect all regional players. Russia shifted its policy on Armenia before the attempted coup in Turkey in July. At the beginning of April, Azerbaijani and Armenian forces clashed in Nagorno-Karabakh in one of the most violent incidents since the implementation of the 1994 Bishkek Protocol and its provisional cease-fire. The clashes left 200 dead on both sides and the prospect for a graver escalation to follow, if no progress on peace talks was made. Russia negotiated a cease-fire in Nagorno-Karabakh on 5 April, and then developed a diplomatic campaign that aimed for a long-term settlement of the conflict. In May, reports citing unnamed sources close to the negotiations said that Russia would present a peace plan, which may include the restoration of Baku’s control over some of the so-called occupied territories (outside Nagorno-Karabakh) that were taken over by the Armenians, as well as security guarantees for the unrecognized republic of Nagorno-Karabakh. In July and early August, demonstrations in Yerevan called on the government to resist Russia’s plan for unilateral concessions. While the protests weren’t big, the fact that they were anti-Russian and were related to the Nagorno-Karabakh resolution is telling. Russian President Vladimir Putin met with the presidents of Azerbaijan, Armenia and Turkey to discuss a deal on Nagorno-Karabakh, but no apparent understanding came through. However, Russia is working on a rapprochement with Turkey, so it will likely push for a resolution on Nagorno-Karabakh, as that gives both Turkey and Azerbaijan something to appreciate. Russia is doing this because it is concerned about what it sees as a U.S. containment strategy in Europe from the Baltic Sea to the Black Sea and possibly reaching Azerbaijan. Moscow has been closely following US relations with Poland and Romania and has grown concerned, as the US builds up military capabilities in both countries. For Russia, the Black Sea is militarily and commercially strategic. Russia has watched Turkey work with Poland and Romania on defense-related projects and it definitely didn’t want to see Turkey joining a U.S.-sponsored alliance in the Black Sea. Russia needed to be less hostile to the Turks to avoid them aligning with the Americans. The talks on Nagorno-Karabakh and the good will gestures are a way for Moscow to build trust with Ankara. Azerbaijan would follow Turkey toward the Russians or the Americans. Azerbaijani foreign policy is complex, with Baku balancing between Iran and Russia in order to maintain its independence. It has always had a strong relationship with Turkey, which it has enhanced during the last few years, as it has acted against the Gülen movement. The two countries share ethnic and cultural ties, and Turkey acts as the main transit country for Azerbaijani energy. Moreover, they share a common enemy: Armenia. Azerbaijan sees Armenia as wrongfully occupying Nagorno-Karabakh territory and a resolution would give back at least part of what Azerbaijan claims to have lost. For Turkey, Armenia is responsible for the way the U.S. has shaped its policy towards Turkey, considering the Armenian genocide, and for bringing Russian forces into the Southern Caucasus. This is why a potential settlement imposed on Armenia could strengthen Turkey’s position in the Caucasus. In return, Russia seeks gains to the rear of what it perceives to be the American containment line in Europe and expects Turkey to pull away from Poland and Romania. Russia giving up part of its position in the Caucasus could trigger Turkey to give in? as well in the Black Sea. This is a smart maneuver to lay the groundwork for a positive long-term relationship, but it is unlikely to come to fruition. The Turkish Foreign Ministry responded to Russia’s gesture, saying it “appreciated the statement by Lavrov.” If Russia and Turkey don’t go beyond gestures, their rapprochement will not last as it doesn’t have solid fundamental basis. Geopolitical forces pay no attention to nice gestures. Geography is paramount, and the Black Sea embeds the geopolitical tension between Russia and Turkey. While Turkey cannot allow Russia to dominate the Bosporus, Russia can’t allow Turkey to be the single power in the Black Sea. For a settlement on Nagorno-Karabakh and for Turkey’s decreasing involvement in the U.S. alliance to be the beginning of bilateral cooperation between Russia and Turkey, the two countries need to continue working together to establish influence in the Balkans or Central Asia. But their interests in these regions often diverge. And once different interests exist, clashes between the two become probable. This is why gestures are nothing but gestures, no matter how significant they may seem. “As the Ottoman Empire was collapsing, the Turks killed a large number of Armenians, which Armenia insists was genocide” – and how many Turks, Kurds, Circassians, Azerbaijanis were killed by Armenians? For some reason, they prefer to remain silent about it. What geopolitics or politics the discussion goest to? All what’s happening in Armenia is under Putin’s control. Armenia is just a puppet of Kremlin. If you call it “politics”, I’m speechless and won’t name it in other words.